Blogs, SEO and social media are great ways to advertise or express yourself in this day and age. I teach college photography and 99.9% of all my students lack basic computer knowledge, or any clue of blogs, SEO (search engine optimization) and the use of social media. I photographed someone from India who was working in IT in this country. I asked him when they start teaching computer programming in school. He said in 5th grade! My daughter is in 8th grade and knows nothing about the subject. However, she can tell you about the war of 1812. Not sure how that is going to help her in the future. 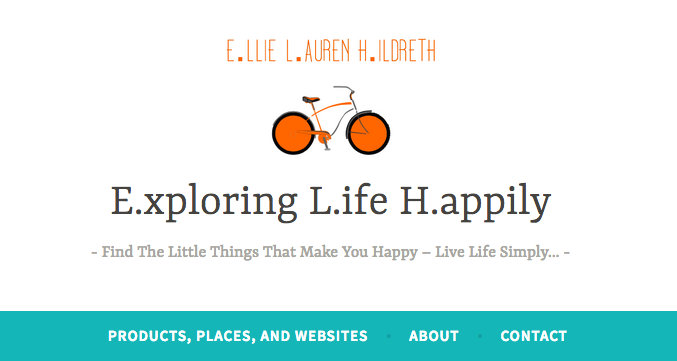 The real point of this blog is to promote my niece who started her own blog titled, “E.xploring L.ife H.appily” Personally, I don’t enjoy writing and partly because I am not that great at it. Take time, click the link and check out Ellie’s blog. P.S. Backlinks and links within a post to your own blog are great for website analytics.